All products by Ellen Tracy now in stock. Trendy V-neck Top from Ellen Tracy direct from her Technicolor collection. 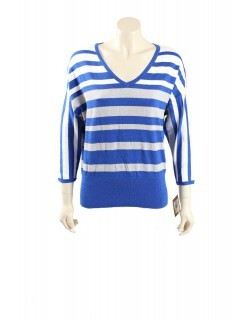 It is a beautifull pullover with blue metallic stripes perfect as casual weekend wear. Ellen Tracy Cocktail Dress. The dress is in chiffon material and is fully lined. One shoulder has gold beading on it. The dress comes to the knee. 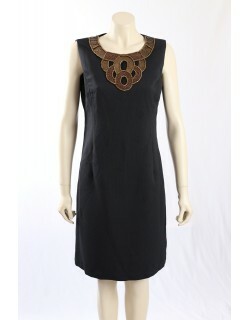 Stunning Ellen Tracy Cocktail Dress for that special cocktail party or event.